Early in Jada's allergy journey, I was trying everything to try to soothe her itchiness. Everything included adding fish oil to her diet. I didn't really see any improvements, but even if I did, that fishy smell was a total turn off! Is it possible to have a fish oil without the fishiness? One that actually provides results? 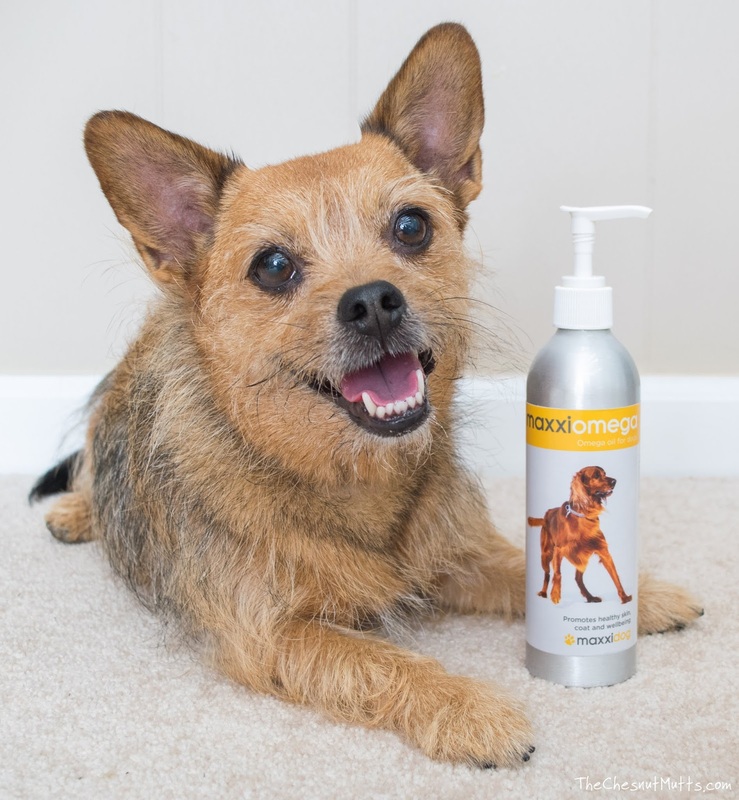 Not only is the product I'm reviewing today stink-free, it is also a well-balanced supplement to help improve your dog's overall health. 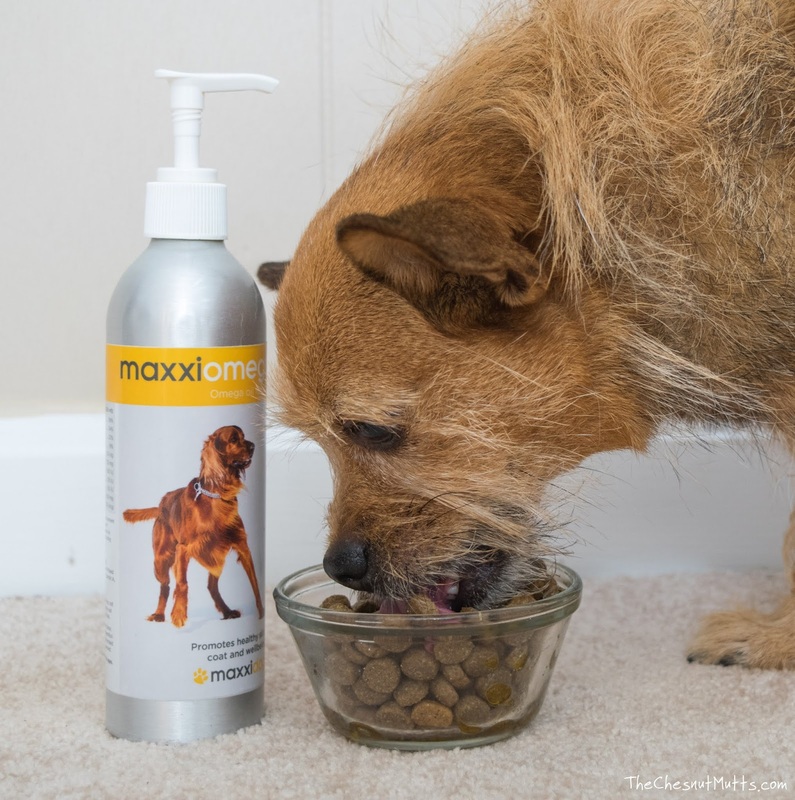 Introducing maxxipaws™ and their maxxiomega oil for dogs! When Asa and Birgir Gislason couldn't find a joint supplement good enough for their dog Molly, they set out to create their own back in 2013. 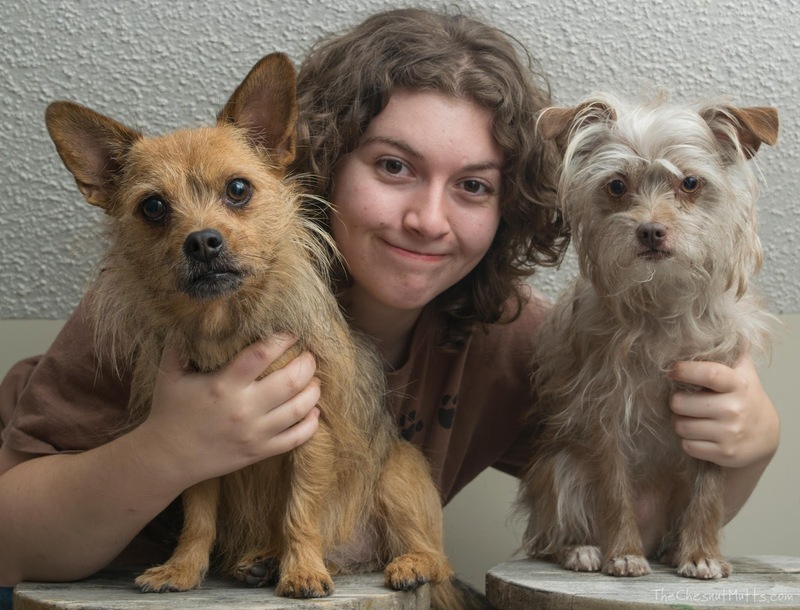 Living in the U.K., they partnered with a manufacturing company in the U.S. that met all their needs when it comes to making pet supplements and began from there. maxxipaws™ (previously maxxidog) was created to provide pet parents with quality supplements with the pet's health in mind. What's so special about fish oil? In general, fish oil added as a supplement to your dog's food can help with the appearance of their coat and skin. 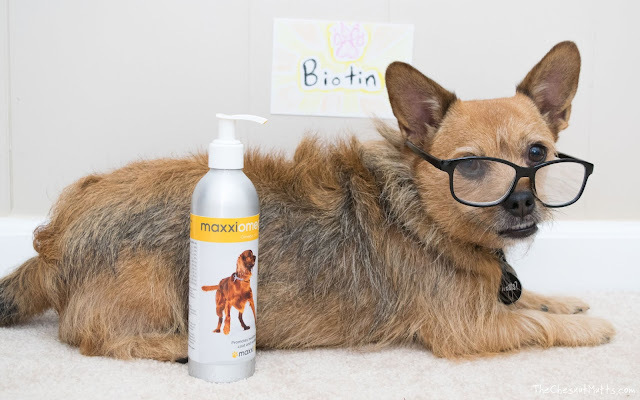 If your dog has allergies or other skin issues, this is always something that is suggested to try out. How is maxxiomega different from other fish oil supplements? What really interested me at first was that it claimed to have no fishy odors. The smell was the main reason we stopped adding it to Jada and Bailey's food in the first place. No one wants to get up close and personal with lingering odors! If you open up a bottle of maxxiomega and give it a good sniff you can smell just a subtle hint of fish, but once you combine it with your dog's food it isn't even noticeable and your pup is smoochable after dinner. Once I started using maxxiomega regularly, I really started noticing a difference. We have been using it for two months and Jada's coat feels soft and her shedding has gone considerably. I was at the point of deshedding and bathing her once a week just to reduce the amount of hair all over the house! Bailey's fur is looking as healthy as ever and even my mom, who hadn't seen her since we started maxxiomega, complimented on how her fur color looks more vibrant. 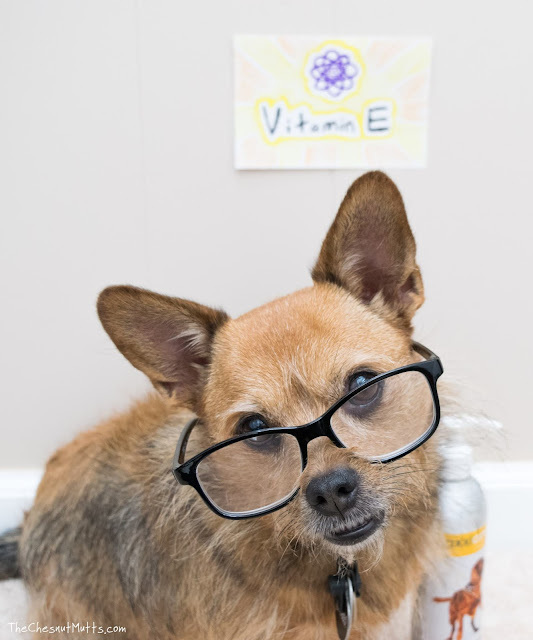 Let's look at the ingredients and break down why each of them is important to provide a balanced supplement for your dog. These fatty acids are anti-inflammatory and can help with your dog's joints, heart, eyes, and allergies. There are three types: docosahexaenoic acid (DHA), eicosapentaenoic acid (EPA), and alpha-linolenic acid (ALA). In maxxiomega, flaxseed oil provides ALA while menhaden fish oil has the DHA and EPA. These fish are obtained from federally-regulated waters off along the Gulf and Atlantic. The Omega 3s are extracted from the body of the fish versus the liver where there are toxic amounts of vitamin A and D that would actually harm your dog's liver after consumption. 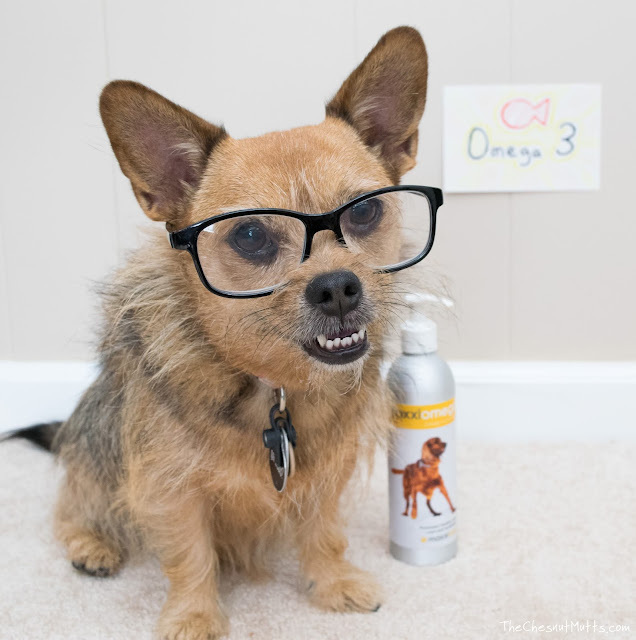 Omega 6 fatty acids are essential which means your dog has to obtain these from their diet. Most dog foods contain these, but it doesn't hurt to supplement and most dogs actually benefit from adding more to their diet. 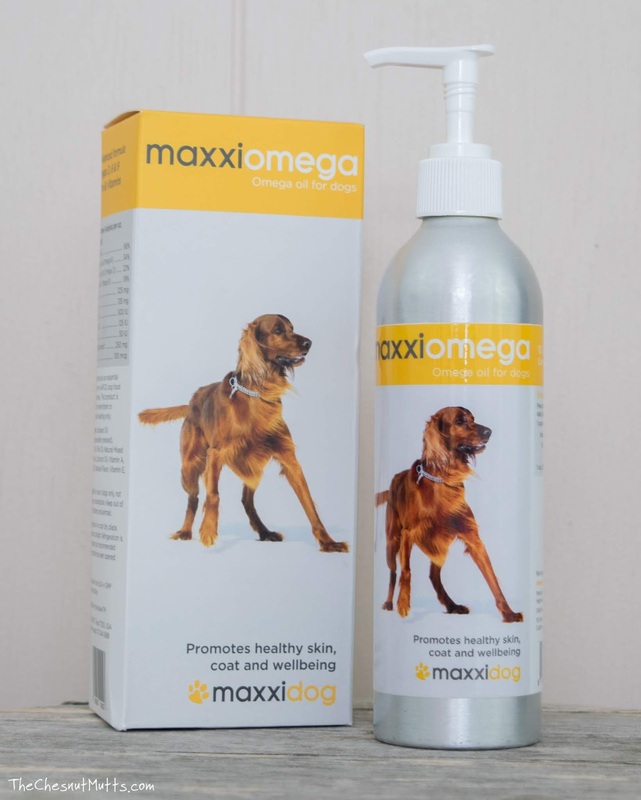 It can help if your dog has a dry or damaged coat, if they are very active, pregnant, a growing pup, or on the older side. In maxxiomega, unrefined soybean oil provides omega 6. With it being unrefined, it contains some more vitamins, antioxidants, and natural preservatives to increase shelf life. 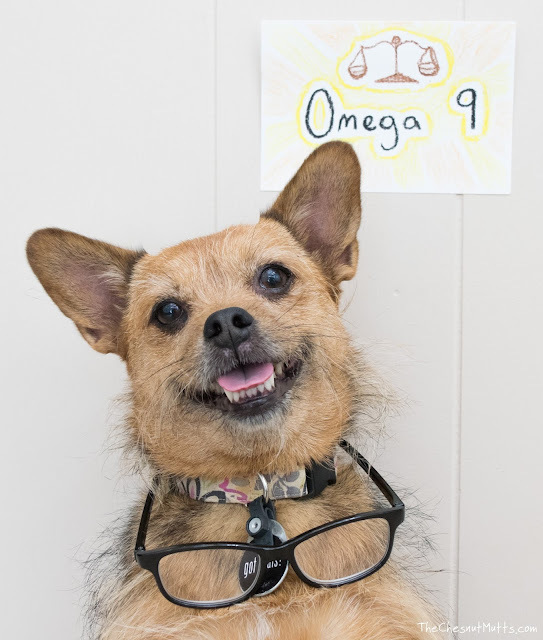 Omega 9 fatty acids are actually not essential since the body can make them, but with the increase of DHA and EPA due to the supplement, your dog's body will use up the Omega 9 it has already made. To keep everything balanced, Omega 9 is added to maxxiomega. This helps to control blood sugar and cholesterol. Just like with humans, biotin can help with skin, nails, fur, and even enzyme functions. Helps maintain a healthy coat and skin as well as eye health and growth. This vitamin is required to absorb calcium and phosphorus to keep bones strong. When you increase the amount of Omega 3 and 6 in the body, you also increase the need for Vitamin E. They work really well together to reduce inflammation in the body. This vitamin is also an antioxidant so it will cling on to free radicals which can cause oxidative damage to cells. Tocopherols, a natural preservative in maxxiomega, is a source of Vitamin E that also helps the oil keep its potency. So why doesn't it have a fishy smell? With maxxipaws' quality ingredient sourcing as well as processing, they are able to remove impurities that cause that not-so-great smell. So after looking over all this information, I became pretty impressed with how they balance everything out. Once you see how much thought went into maxxiomega, the no-fish smell becomes icing on the cake! maxxipaws™ is a company based in the U.K. that manufactures high-quality pet supplements in the U.S.
maxxiomega is their fish oil supplement that has no fishy smell and is very well balanced with Omega 3, 6, 9, and other vitamins. 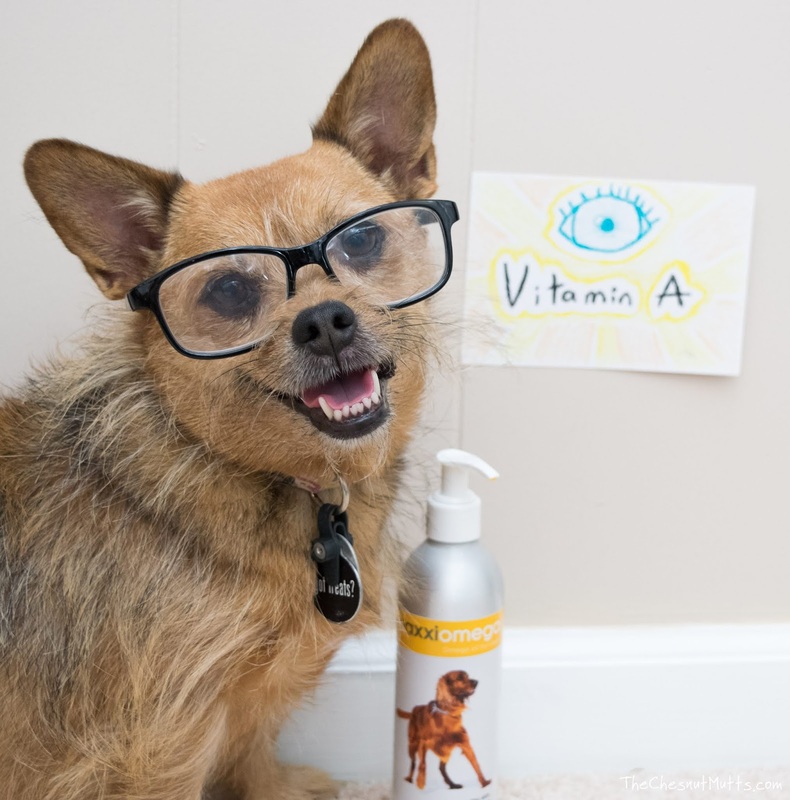 All these nutrients can help with your dog's skin and coat as well as their overall health. 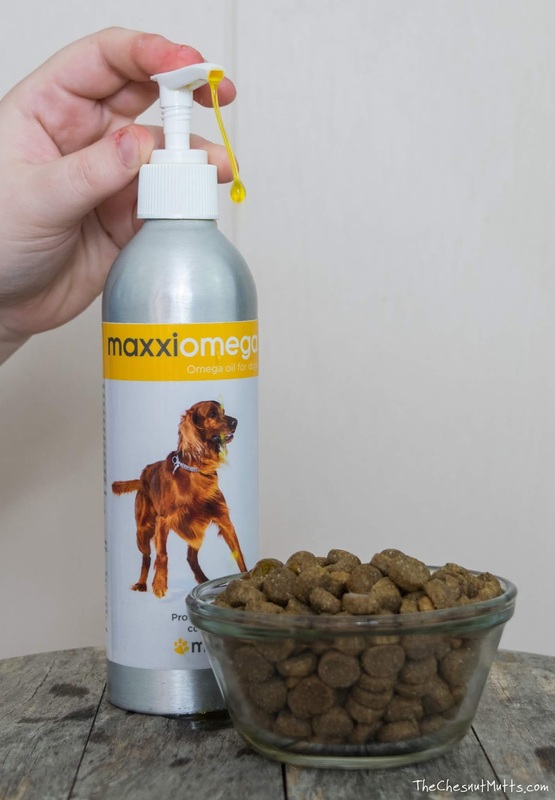 maxxipaws' maxxiomega supplement oil has been a really great addition to our feeding regimen. 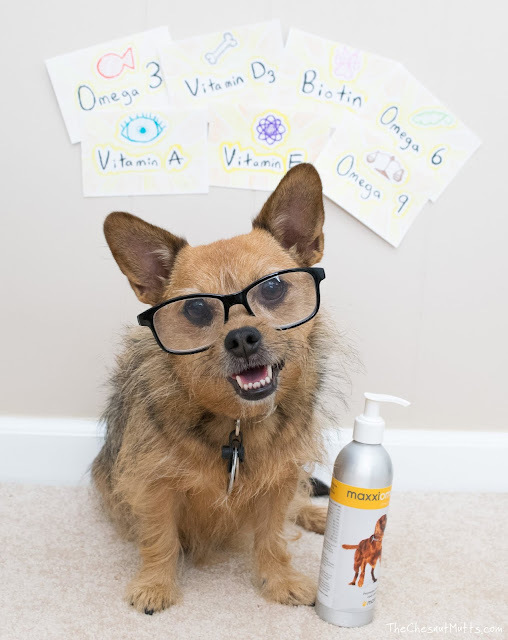 With the science behind the ingredients as well as their high-quality, I know that I am improving my dogs' health. 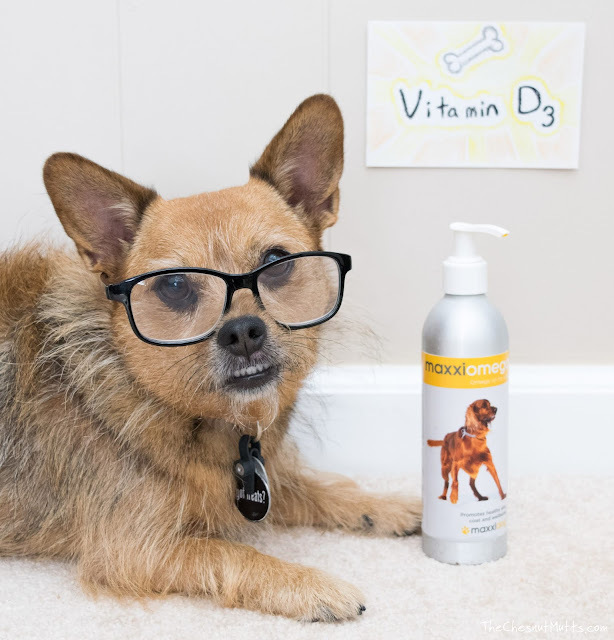 We would definitely recommend this supplement to anyone who wants to bring out a natural healthy glow to their dog's coat, help their joints, or even their overall health. What do you like most about maxxiomega? 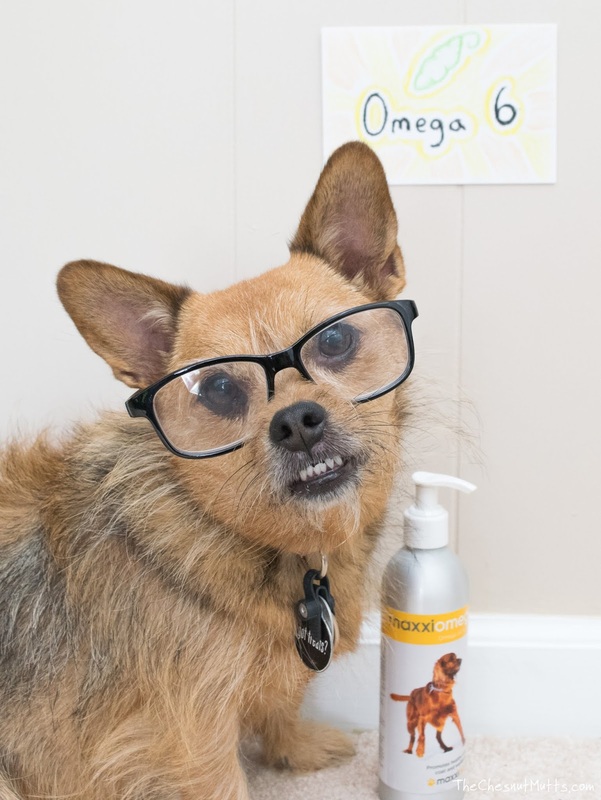 I like that maxxiomega fish oil has a good amount of omega 3,6 and 9 to make your dog's skin and coat healthy and that it doesn't smell fishy. Both of my dogs are itchy and have skin issues and this would be a great supplement for them! i like that it has a combination of Omega 3, 6, 9. some products only have 1 or 2, all 3 are better. i also like that it does not smell like fish, even though my dogs love fish. I like that it doesn't have a strong fishy odor. This supplement has all things my dogs need to help their joints which is so important in older dogs. I like that it will help with the appearance of appearance of their coat and skin. I like that it potentially can allow my chihuahua to live longer. Even one extra day would be worth it. I like that it helps with their overall health. I would like to try this to see if it would add benefits to joint health. Thanks! I like that all of the nutrients can help with your dog's overall health. I love all the benefits it has for overall health. 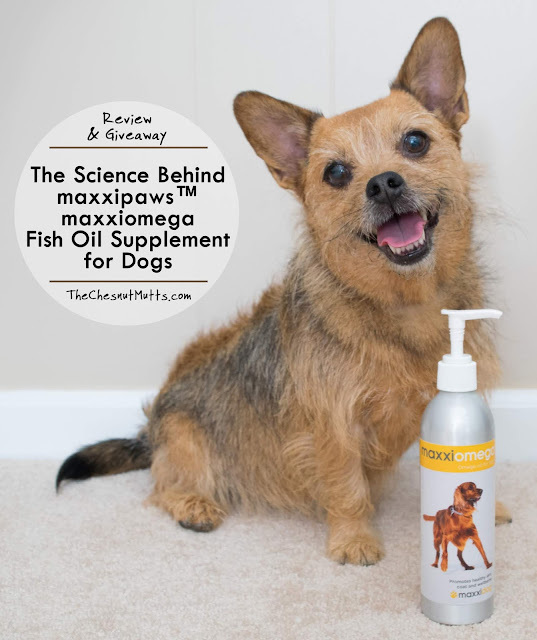 I've never tried fish oil so I would be so excited to win this for our three pups. BTW, I absolutely love your website, and the pictures of your pups are so cute!! I love that this product has all the ingredients that are safe and good for my bulldogs. I love that it comes without that smell. I like that it helps the dog's joints, heart, eyes, and allergies. I like that it addresses the pet's overall health and not just one or two issues. No strong oder!! I cant stand a fishy smell!